Since high school, Omar Salem, has known what career pathway he wanted to drive down. He’s always been interested in cars and through VCAL (Victorian Certificate of Applied Learning) at Copperfield College, he studied a Certificate II in Automotive. Upon graduating Year 12, Omar was seeking a Panel Beating Apprenticeship. He heard about the Citi New Recruits program and decided to take part to gain more knowledge and further increase his chances of landing an apprenticeship – the first step towards his dream career. Omar, 18, spent two weeks at the Kangan Institute Automotive Centre of Excellence participating in the program. He had the opportunity to learn job-ready skills and also gain hands-on experience in an automotive workshop. He says the program was “great” and the teachers were “very helpful and amazing”. “I learnt about safety, how to act in a working environment, how to be respectful and responsible and how to work with teammates,” Omar says. 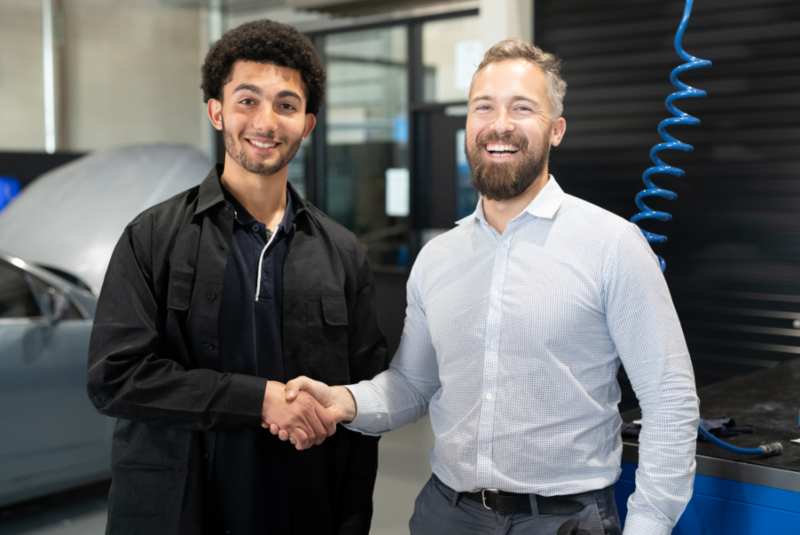 As part of the program, Omar did a week of work placement at Mercedes-Benz Melbourne Autobody. He says the program helped him understand the expectations of the workforce – things like how he shouldn’t be on his phone, and that he should always be busy. He impressed the team and was offered a full-time Panel Beating Apprenticeship. “I was so happy when I got offered the role,” Omar says. Since then, Omar has been enjoying his apprenticeship and is grateful for his supportive team. He plans to finish his apprenticeship and continue working as a qualified Panel Beater.